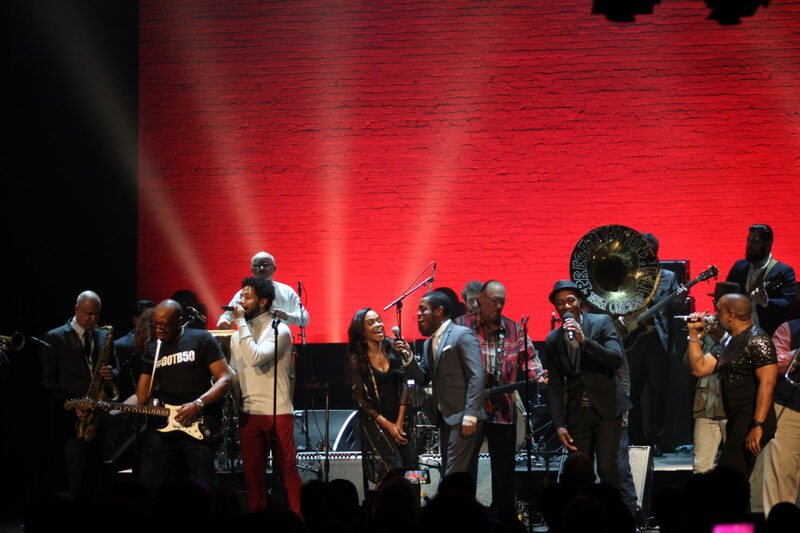 On Thursday at Harlem’s revered Apollo Theater in New York, more than a dozen music legends, rising stars and offspring of an R&B icon performed in one of the most hallowed spaces in music history to honor an anthemic song and the man who sang it: Otis Redding. Nearly 50 years ago, Redding’s “(Sittin’ On) The Dock of the Bay” was released four months after his death in an airplane crash into Lake Monona in Madison, Wisconsin. 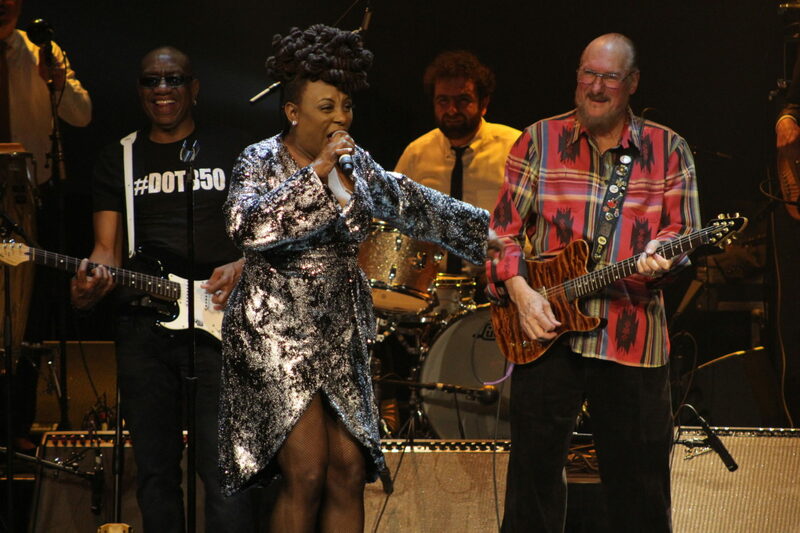 “An Evening of Respect: Celebrating Otis Redding” was held not only to honor the lasting endurance of his only top 10 Hit on the Billboard Hot 100, but also to affirm his legacy through raising funds for the Otis Redding Foundation in Macon, Georgia. Produced by JAM Inc., Jonathan Shank for Red Light Management, the evening was simultaneously a raucous celebration as well as a somber reflection at the early loss of a widely beloved troubadour. The Otis Redding Foundation is an educational nonprofit that uses music to inspire and motivate youth intending to explore it as a career, or simply bring focus and purpose into their lives. “Respect” concerts honoring the organization’s namesake and generating funds began eight years ago primarily in Macon, Georgia — Redding’s hometown — and the foundation was started in 2007. One of his four children, Karla Redding-Andrews, is the executive director. For “Satisfaction” and “Can’t Turn You Loose,” King joined in with Haynes wearing a bold red suit and white hat while shredding his Gibson guitar and plaintively singing on “Loose.” It was a stunning battle of axes with the elder lion opposite the young cub trading guitar licks and turns singing solo. Empire star Jussie Smollett added some Hollywood glitz, singing “Cigarettes & Coffee,” sitting on a stool at the center of the stage, wearing a white open-collared shirt and pink pants. By the time Stax Records’ legends Steve Cropper and Booker T Jones of Booker T. and the MGs came out to join the Dap-Kings for “Green Onions” and “Hip Hugger,” the onlooking crowd at the Apollo was fully entranced and willing to do anything the artists asked of them. Destiny’s Child’s Michelle Williams gave an understated, heart-rending performance of “A Change Is Gonna Come,” lending it an immediacy and urgency felt by everyone listening. As the evening winded down for the expected all-star rendition of “Dock of the Bay,” the majority of the invited musical guests slowly came on to back Dexter Redding and Aloe Blacc trading lyrics before a euphoric, near universally standing audience. Read the entire review at Billboard.